This week's theme is all about GLITTER! We would love for you to participate with us in our THEME WEEK and it's quite easy to do so! 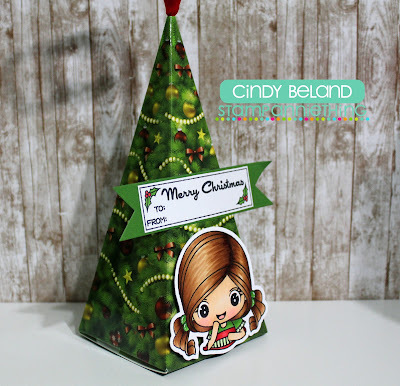 Simply create a project using ANY Stamp Anniething product (as your main focal point) in the set "theme" for this month. Post your project to the corresponding album over at our Face Book Group page (Stamp Anniething Stampers)! You may enter as many projects as you wish, but you will only be counted as ONE entry person. A minimum of 5 people (not including DT Members) is needed in order for a prize to be given. So here we go for December's Theme Week! Make ANY project that is inspired by GLITTER! Hi there! Happy New Year!!! It's Katya Bess from Kattyxotica's Kreations. This is my last DT card at Stamp AnnieThing, it's a little sad but happy I had a chance to be here. I will still stalk everyone on Facebook or the blogs as usual... heehee maybe Anne will let me be a Guest DT sometime... Thank you Anne for giving a chance to color up your cute little images and being part of a nice DT. The DT gals are all so talented and always very inspiring. So, for my inspiration card I used glitter pens. and then went over with my Clear Star Gellyroll. The Clear Star Gellyroll is my most favorite glitter pen. with my handy dandy Clear Star Gellyroll. Here is a close-up of my coloring. so I wanted to show you both. I hope you enjoyed the card. I really hope you have an awesome 2017.
and good luck to the new DT. Hello! Melissa from Doxie Mel Designs playing along with a new challenge. Here is my take on the Challenge. I added glittery washi tape to my card. I colored Jemma Party Time with Copic Markers. Have a great weekend and hope to see your project at the Glitter Challenge. Make ANY project with GLITTER. All projects must be uploaded by midnight PST Jan 6th to qualify. This is the sweet little Stamp Anniething ~ Melanie : You're Sassy. I colored her hair and skin with Copic Sketch Markers. The sentiment is from the Jaded Blossom ~ Elegant Holiday Greetings. And for her pretty dress I added Firefly ~ Stickles. 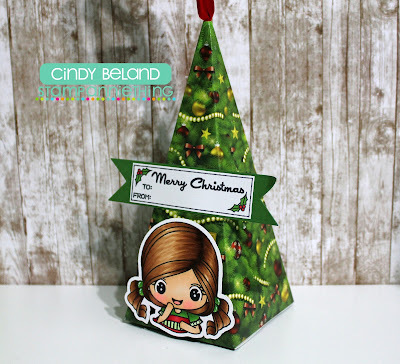 The beautiful tree is a die cut I received from a friend. And for the snowy hills, I added some Star Dust ~ Stickles. Hi friends! 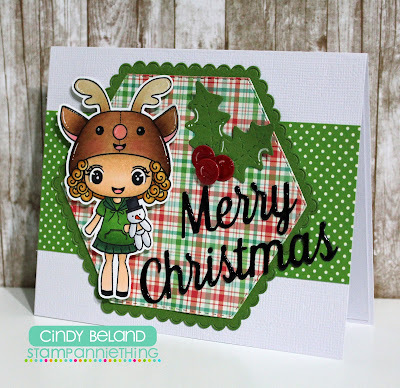 It's JoAnn from JoBoogie Stamping and it's time for another Theme Week! 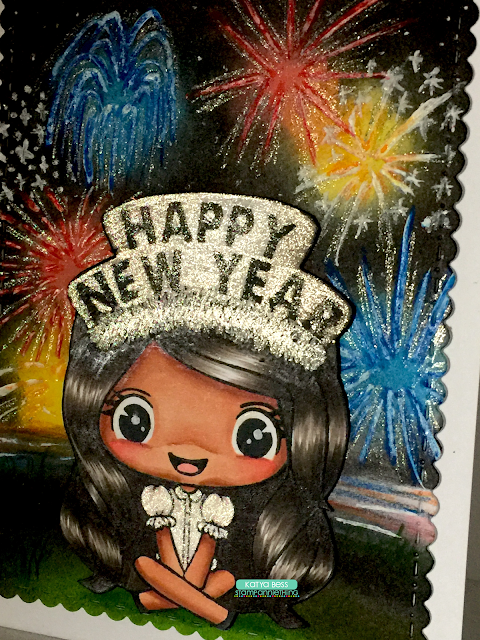 For my card this week, I wanted to be festive and decided to use Annie - Happy New Year! I thought she was super appropriate for this time of year and decided to color her up with simple black, whites, and GOLD! Thank you for checking out my card! This is the last card I'll be creating for Stamp Anniething as a design team member, but I'm sure I'll be back to play along with all the fun theme weeks and I'll be checking out the fun design team projects that the new design team will be creating! A BIG HUGE THANK YOU goes out to Annie for this fabulous year and for feeding my creativity with such fabulous images to work with. Thank you to the rest of the design team of 2016 - Cassandra, Gigi, Cindy, Melissa, & Katya for their inspiring and creative projects. They always seem to blow my mind with their talent! Be sure to check them out! Anyway, thanks so much for stopping by today! I hope you get along to play with us over at our Facebook group found HERE! We always love seeing what you create! 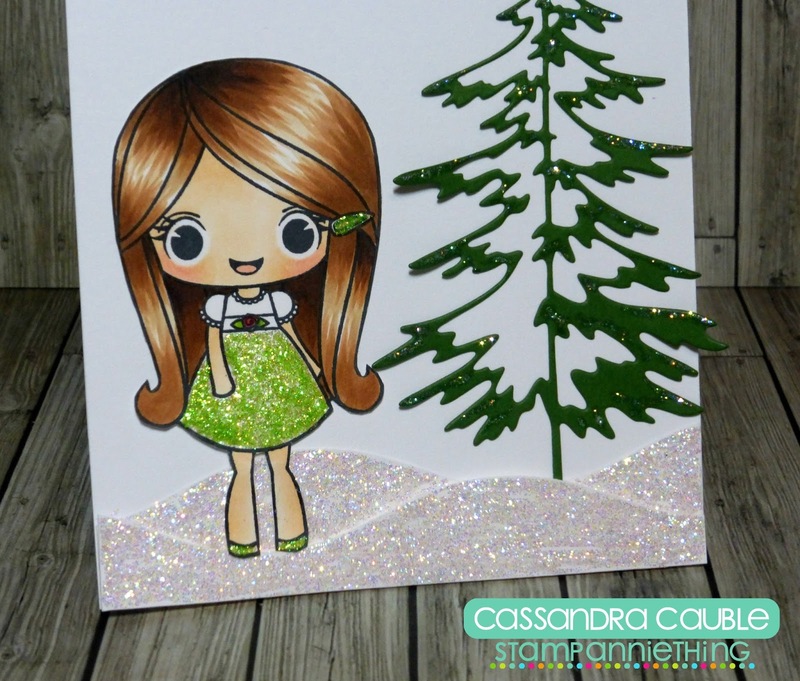 Make ANY project using GLITTER! I used the Paige-Sugar and Spice stamp set for my Theme Week card. 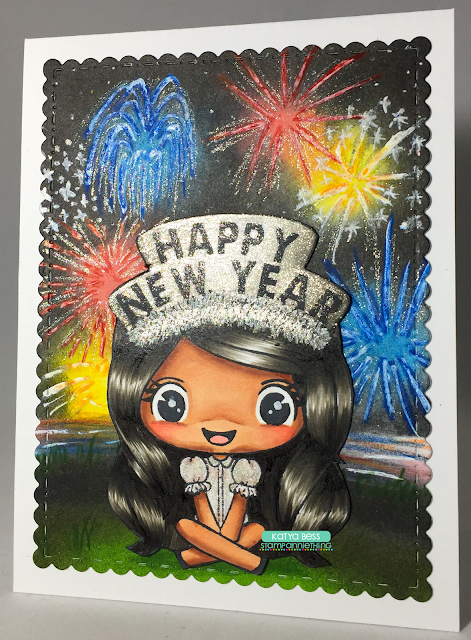 I started this card with a standard A2 card base and created the background mat. I used a piece of cardstock to mask off the snow and inked the sky, heat embossing a snow background using the Jaded Blossom Holiday Splatters. 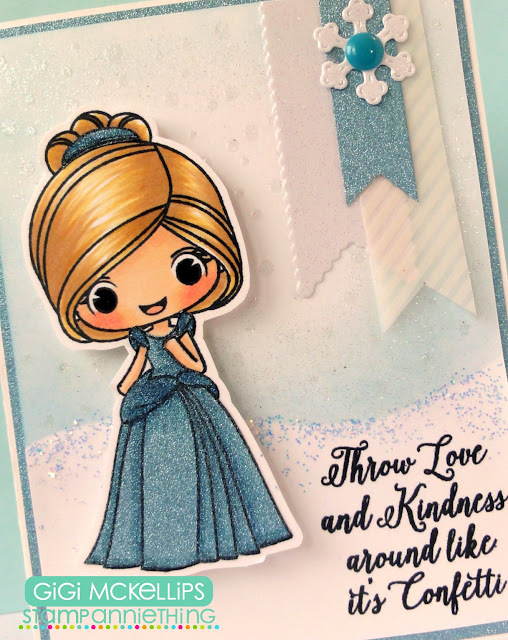 I added stickles to the snow line and stamped the sentiment from the Love and Kindness stamp set. I stamped Paige and half paper pieced/half colored her with Copic markers. 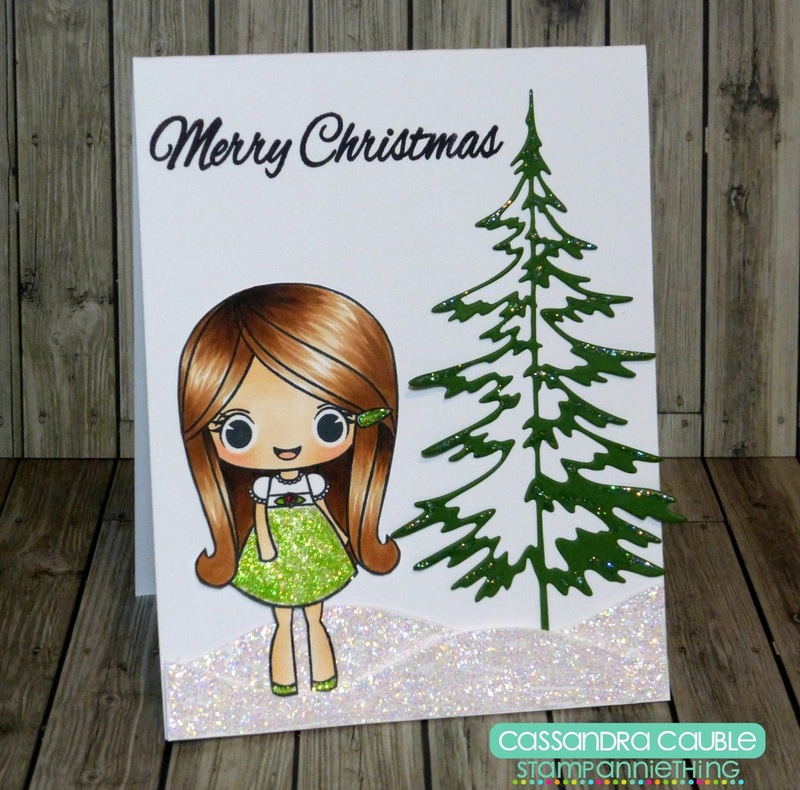 I cut her out by hand and added her to the card on pop dots. To finish, I created the banners at the top cut with the Flag Dies 2 and the snowflake from the Winter Dies. Hello! Melissa from Doxie Mel Designs here with you with a new card. Most children get new PJ's for Christmas morning. I though it would be fun to color up Holly as if she was waiting for Christmas. She is Colored with Copic Markers. I found the sentiment at Jaded Blossom, Holiday Pampering. 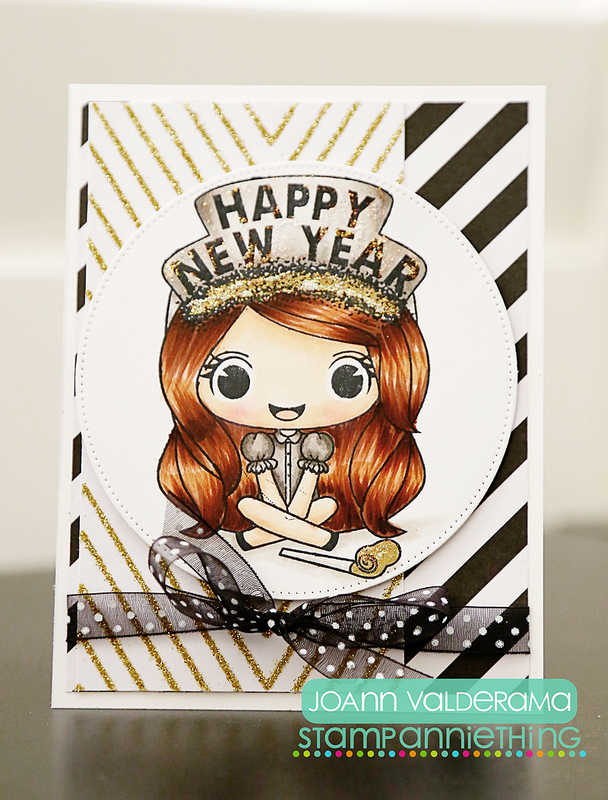 JoAnn from JoBoogie Stamping here with another new card! Can you believe that Christmas is only a few days away??? Neither can I, but I'm still trying to scramble with wrapping presents, gathering stocking stuffers, and doing some Christmas crafting! I colored up the adorable Lucille - What a Deer with my Copic Markers. I honestly love her little reindeer hat on - it's so super festive and fun. It really completes her outfit, don't you think? I used a lot of Christmas paper that I had in my stash (please remind me never to go shopping for Christmas paper again - I think I have enough to make 1000+ cards! LOL). I added some holly "bling" for some dimension and thought it would be fun as a sparkly element! Finally, I stamped the "what a deer" sentiment from the stamp set onto some kraft cardstock and punched it out with my Modern Label punch (retired) from Stampin' Up. Whew! I do believe this may be my last Christmas card for 2016! What a wonderful year it's been! 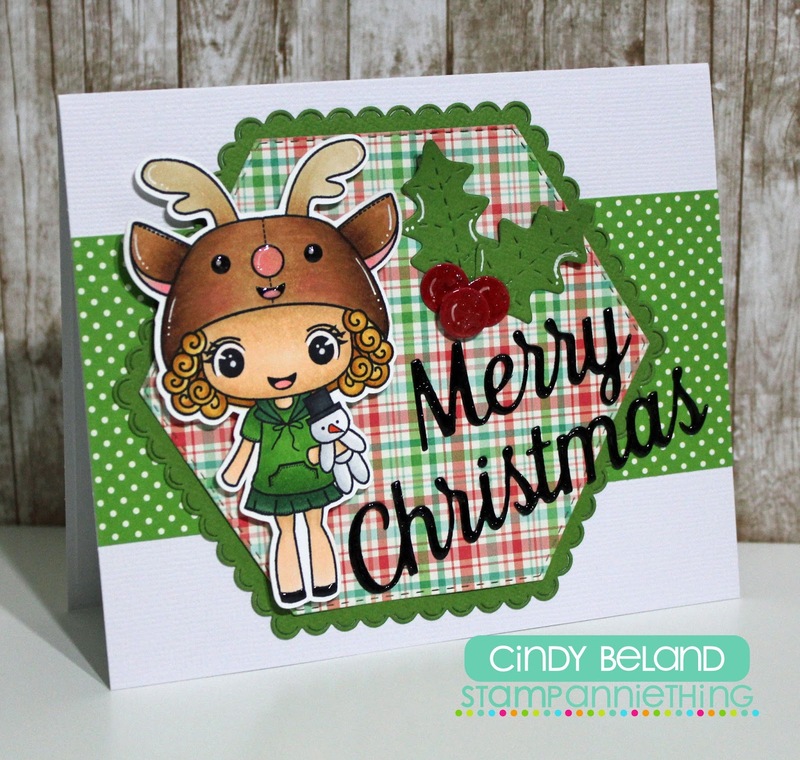 Thanks so much for stopping by the Stamp Anniething blog and for checking me out today! Hope you're having a wonderful holiday season and MERRY CHRISTMAS to you and your loved ones! 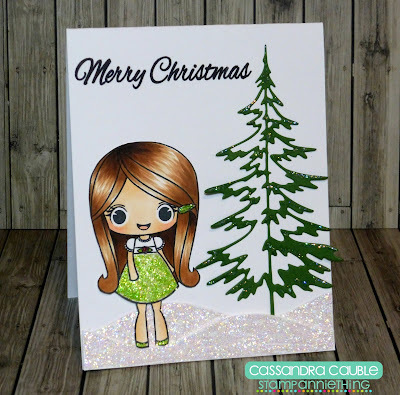 I used the Paige-Holiday Magic stamp set for my card. I stamped and half paper pieced/half colored Paige with Copic Markers. I added background mats cut with the Rectangle Dies and the smaller flag cut with the Flag Dies 2. 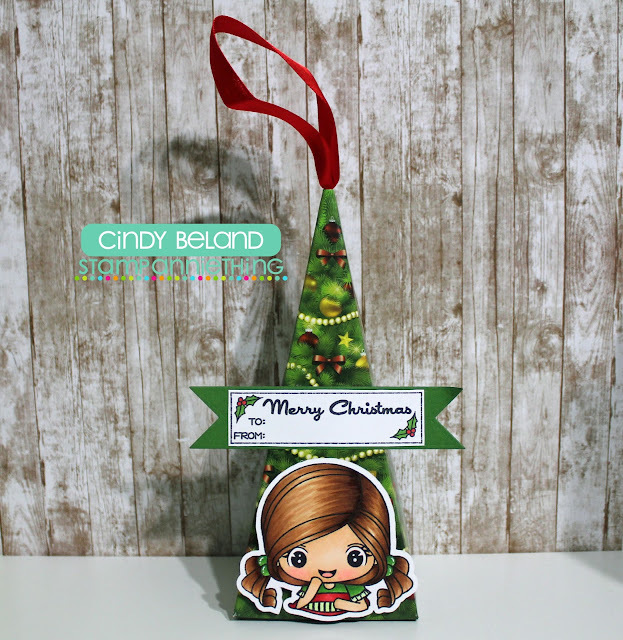 I punched the santa heads from pattern paper and added them to the banner and bottom. To finish, I stamped the sentiment from the Merry and Bright stamp set. Scallop Hexagons with the Stitched Hexagons for the bottom layer, the Christmas Dies for the holly, the Christmas Dies 2 for the Merry Christmas. JoAnn from JoBoogie Stamping here with another new card to share with you today! Christmas is only 11 days away - can you believe it?! I really can't, but I wanted to get into the holiday spirit by creating a new Christmas-themed card! I colored up Brooke - For Someone Sweet because she truly speaks to me. I mean, come on, how cute is she with her little knee-high socks and candy cane! I kept the card simple, making sure I stuck with the red/green/white theme. I love traditional Christmas colors, don't you?! Thanks so much for stopping by today! Hope you're all enjoying this holiday season! Be sure to check out my blog for more fun! I used the Diana-Sweater Weather stamp set for my card. 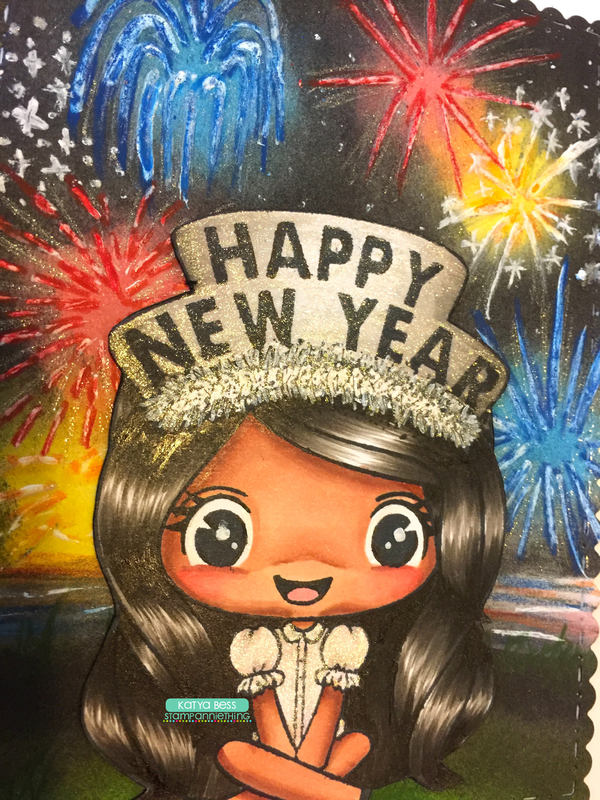 I stamped and colored Diana with Copic markers, adding her to the card on pop dots. I placed her on a mat cut with the Goody Bag Die and added a sentiment tag to the side stamped with the Holiday Gift Tag stamp set. 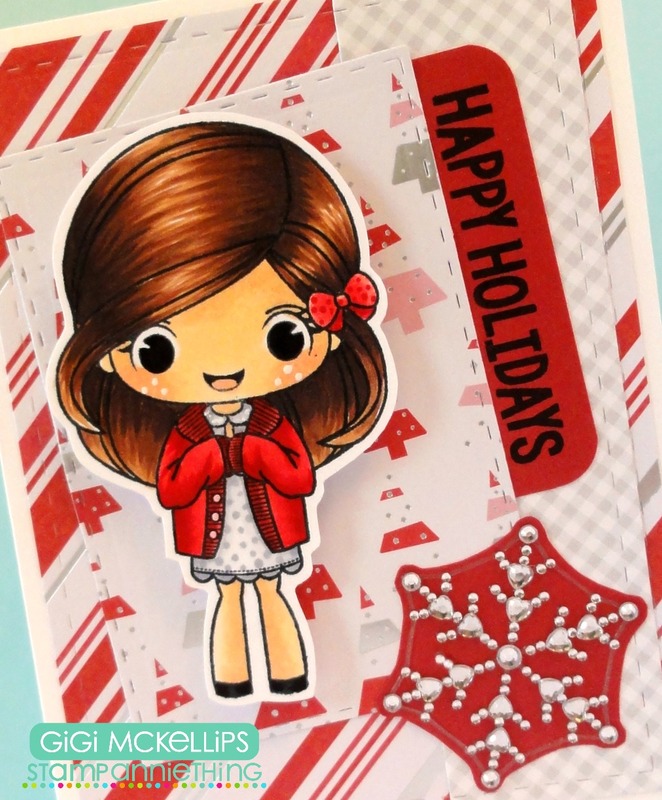 To finish, I added a gem snowflake to red cardstock and hand cut it out, adding it to the corner of the card. at Stamp Anniething!!! For today I decorated a Treat Box, cute little gift idea!!!! Flag Dies ﻿for the banner and the Holiday Gift Tags for the sentiment. 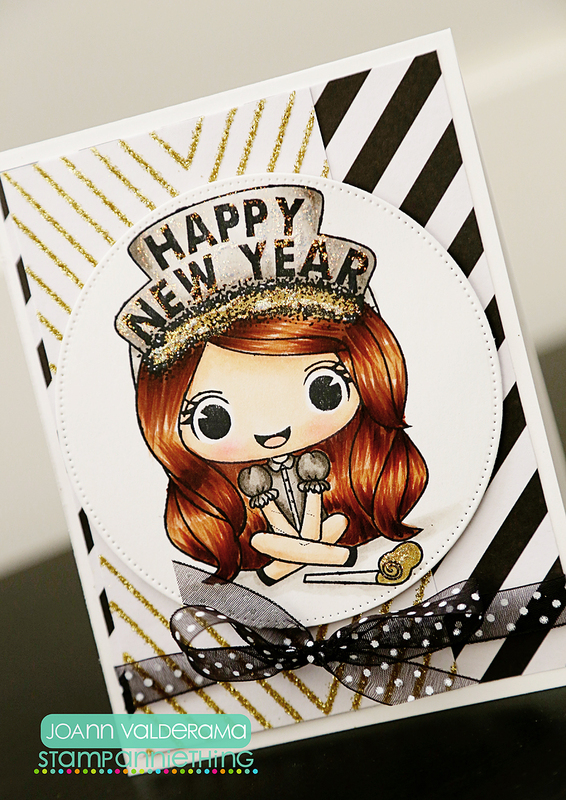 December Release Day #3 - Annie Happy New Year!